We wonder how many students Principal Chipain has actually been talking to, especially before this letter was written on Monday morning. How would he know? Has he been monitoring the nausea, the headaches, the imbalance that his students have been having over the weekend? How many children didn’t come to school on Monday? What we know about carbon monoxide poisoning is that it damages cells in two different ways. First, by starving the cells of oxygen, like you might see in a drowning. Second, it leaves behind a poison that continues to cause toxic damage to cells for weeks after the hypoxic effects have warn off. The only thing Principle Chipain could have known about the health of his students on Monday morning is that none of them died from lack of oxygen. What he could have no idea about is the degree of permament cell damage, particularly brain and heart damage, from the toxic effects of the poison. It is time for the Chicago Public Schools to accept accountability for the unsafe and unwelcoming environment in which it placed its student on October 30, 2015. That accountability must start now with warning parents (and teachers) that the toxic effect of carbon monoxide poisoning is continuing and that children need to get medical treatment and diagnosis for this poisoning. Carbon monoxide poisoning will likely impact the thinking, the mood and behavior of a significant group of those who were poisoned on last Friday. Why is it important that teachers also understand about carbon monoxide poisoning? Not just because they were poisoned too but because the children they are trying to teach will have a much harder time learning because of this poisoning. Memory and concentration will clearly be impacted. Behavior extremes and acting out are more likely. Young children may suffer from deep depression. Even visual abnormalities and balance problems are common. Yes, school board, get carbon monoxide detectors into the classrooms. But also get doctors, neuropsychologists and speech/language pathologists to explain to the Prussing Elementary community, just how big of a whole in the future of those kids, this carbon monoxide poisoning event caused. Principle Chipain of Prussing Elementary School tells parents everyone is doing well. Some parents and students see it different. 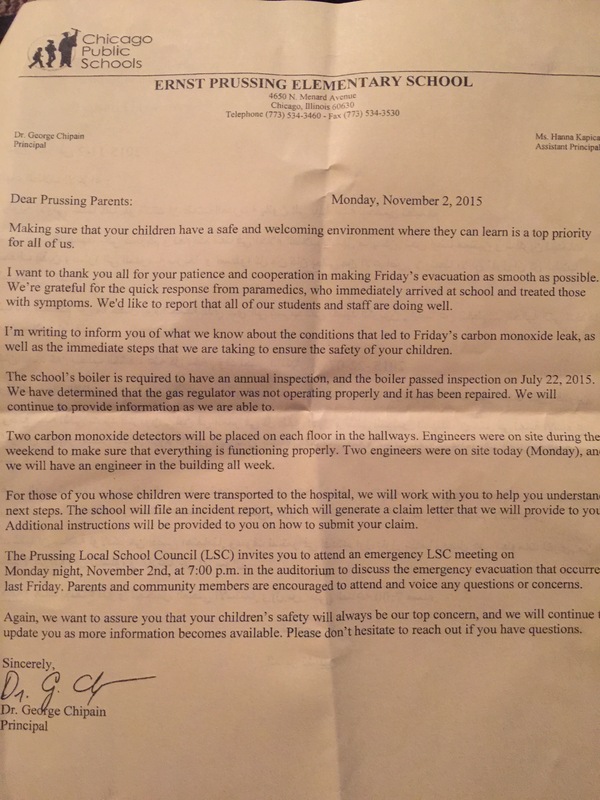 Chicago School Carbon Monoxide Poisoning Lawsuit	Boiler or Chimney System at Fault for Prussing Elementary?